Tom Cruise's sixth Mission: Impossible film has landed, with reviews heaping praise on both the pace of the film and the 55-year-old's stunts. Cruise returns as US agent Ethan Hunt, battling a global catastrophe while defying death with alarming regularity. He's "ageless", with the film getting "better, twistier and more deliriously fun with each instalment", according to Entertainment Weekly. The Hollywood Reporter, meanwhile, praised director Christopher McQuarrie. It said that with Mission: Impossible - Fallout he "tops what he did with Cruise three years ago". Vanessa Kirby [Princess Margaret in Netflix series The Crown] is also singled out for playing "a wildly wealthy philanthropist and apparent part-time arms dealer" with "a mix of elegance and frisky abandon". The Express highlights the "brutal and gut-punching" action and Cruise's stunts, including the one in which he broke his ankle by leaping from one building to another, which features in the film. The paper adds: "Cruise gives his all when it comes to those stunts again which we won't spoil, but do watch out for the real one that went wrong, delaying shooting for months." 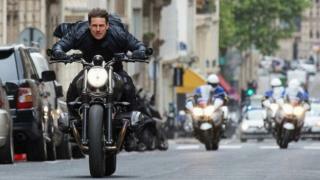 Alongside the "insane" action, Cruise does "what look like real - and really dangerous - stunts". The Wrap described him as an "evergreen movie star with the daredevil heart of a stuntman". Variety said that of the six Mission Impossible films, "with each one surpassing the last" this one is "the most exciting and ambitious of the lot". "[McQuarrie's] combat scenes are tense, muscular, and clean," it said, adding: "He places audiences just over Cruise's shoulder, or staring into the actor's face as he grimaces with exertion." The film is summed up as "spectacular and eye-popping" by The Telegraph which called it "the blockbuster of the summer" with "a pleasingly sinuous plot". The newspaper praised its use of London as a backdrop, saying: "When Cruise is clambering around St Paul's, over the top of Blackfriars Bridge and right the way to the summit of the Tate Modern, it's oddly beautiful to watch London geography being so crisply respected". The Guardian is slightly more lukewarm, saying "there isn't as much humour in the dialogue as before". But, it adds: "Crashes and petrolhead spills are what this franchise is reasonably expected to deliver. And this is what it cheerfully does."